Do the Queer Eye Guys Keep in Touch With Their Makeover Subjects? 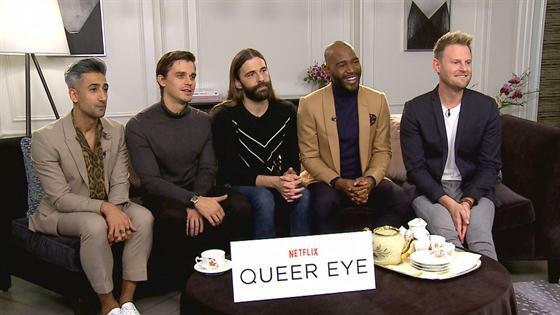 Each episode, the Fab Five of Queer Eye— Karamo Brown (Culture), Antoni Porowski (Food & Wine), Bobby Berk (Interior Design), Jonathan Van Ness (Grooming) and Tan France (Fashion)—swoop in for a makeover and leave seemingly as quickly as they arrived, but just because cameras have turned off doesn't mean that's the end of their contact with their makeover subjects. "I get on the regular charcuterie and cheese platter photos from our friend Neal," Antoni told E! News. "This is a guy who loved cooking and for a decade he lost that interest, he lost that spark. When we were exploring his kitchen, I found all these kitchen tools that had been neglected for almost a decade and to see that spark light up again and find that interest—"
"I thought I was the only one who got daily pictures from Neal," Bobby interrupted. Seems Neal is sending quite a few updates to the new Fab Five. Neal isn't the only new friend who has been keeping the guys in the loop about their new lease on life. Episode three of the series features Cory, a white police officer, with whom Karamo said he needed to have a frank discussion with about the political climate between police and black Americans. "It was hard for me just to come in there and not have that conversation, so we had to have the hard conversation, and because of that I've now made a life-long friend. He and I text all the time," Karamo said. It's not just texting, the two are now exchanging fashion secrets. "He bought the shoes and then sent me a photo and I went to the store and bought the same exact shoes," he said. Just how changed is Cory? Click play on the video above.